About 170 light-years away, a massive comet-like object fell into a white dwarf star known as WD 1425+540. This object ripped apart and scattered its life-building components all over the star’s atmosphere. An international team of scientists published a study Thursday in Astrophysical Journal Letters which details how the star’s atmosphere is now rich in the elements essential for life: carbon, nitrogen, oxygen, hydrogen, and sulfur. The new findings are particularly notable for being the first time nitrogen has been found in debris falling onto a white dwarf. This comet-like object has a chemical composition similar to Halley’s Comet, but it’s 100,000 times larger. Since the planetary system of this star likely contains the necessary ingredients of life, there might be other systems out there with similar characteristics. Scientists know of about a dozen other white dwarfs polluted with debris from rocky, asteroid-like objects, but this is the first time they’ve observed an icy, comet-like object polluting a white dwarf’s atmosphere. About 30 percent of the object was made up of water and other ices, and 70 percent was made of rocky material. Scientists believe in the past 1 million years, this object (possibly a minor planet) was orbiting around a white dwarf, but its orbit was altered, probably because of the gravitational pull of another planet. The minor planet ended up traveling close to the white dwarf and getting ripped apart by the star’s strong gravitational field. 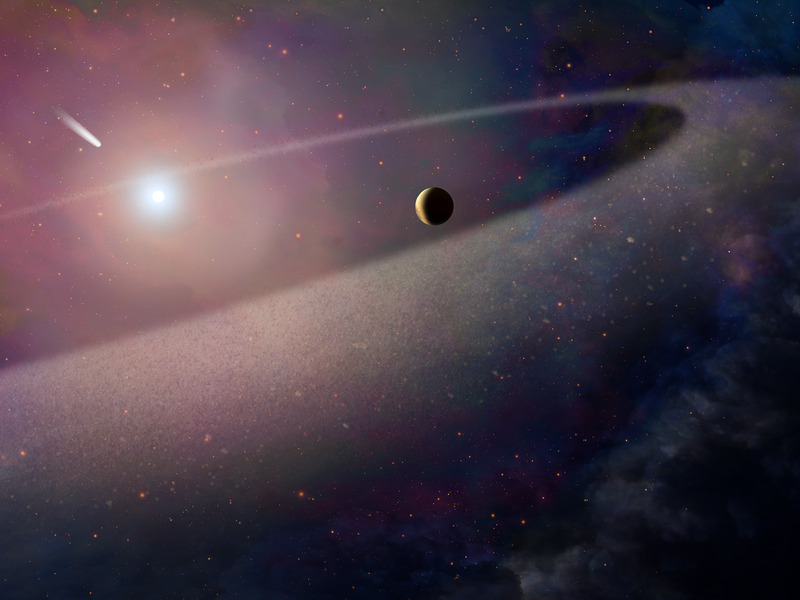 Another explanation is that the companion star of the white dwarf disturbed the belt, causing objects from the belt to move toward WD 1425+540. This likely means that there’s a belt of comet-like objects orbiting the star left over from when the star evolved from a swelled-up red giant to a collapsed, burnt-out white dwarf. The fact that nitrogen was in the debris surrounding the white dwarf star indicates that it may have come from further out in the planetary system. That belt probably resembles our solar system’s Kuiper Belt — home to Pluto, other dwarf planets, comets, and objects left over from when the solar system formed. This artwork shows a section of Kuiper Belt, home to Pluto, dwarf planets, comets, and other icy objects. It’s promising that this other planetary system has the essential building blocks of life, but the question of whether there’s extraterrestrial life somewhere out there in the universe remains unanswered. However, many scientists believe that when Earth was first formed, it was bone dry. 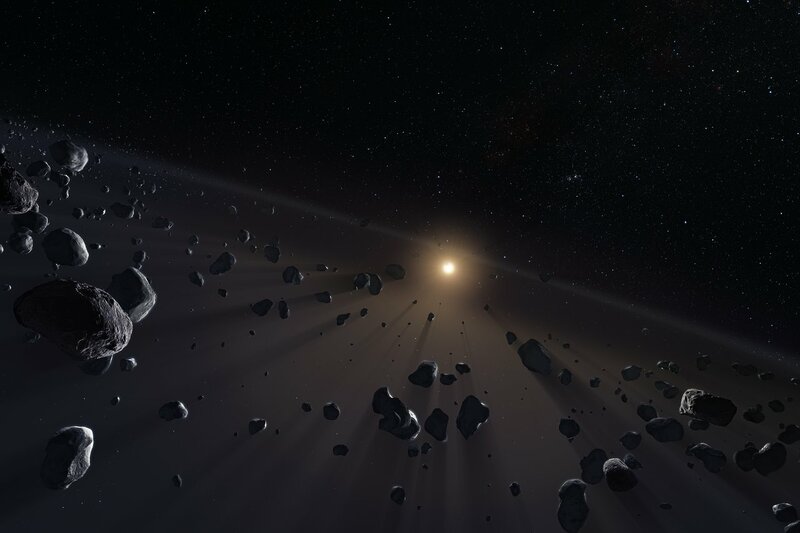 Comets from the Kuiper Belt later delivered water and other essential ingredients for life. Perhaps life originates from outer space, and objects like the comet-like body that fell into WD 1425+540 sow the seeds to life.